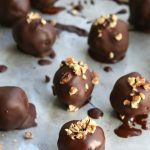 These keto Pecan Pie Truffles are easy to make and so delicious! 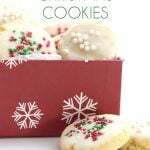 They are a perfect low carb sugar-free treat for the holiday season. The holidays are made for chocolate. Or maybe chocolate is made for the holidays. Well, regardless of this little chicken vs egg thing we have going here, the fact remains; chocolate and the holidays are made for each other. And I take this very much to heart: stocking up on plenty of chocolate for baking and sharing well in advance of Thanksgiving, dreaming up recipes the moment there is even a slight hint of a chill in the air. Baking with chocolate during the holidays makes me feel cozy and warm, and sharing my baked goods with others just feels like good old holiday spirit. I feel like you can make almost any goodie more special and holiday-like by dipping it in chocolate. Or drizzling it with chocolate. Or spreading it with chocolate. Or glazing it with chocolate. Just somehow schmearing it with chocolate, particularly dark chocolate, and suddenly you have a truly special holiday treat on your hands. But it really can’t just be any old chocolate. Trust me, I’ve had years of experience doing this. Nearly 30 odd years I’ve been baking and messing around with chocolate, melting it carefully over the stove and try to drizzle it or spread it or dip things into it. I’ve had some spectacular failures, where the chocolate seizes thickly and you just can’t seem to recover it. And even some where the chocolate melts but is simply too thick for dipping. That can definitely put you out of the holiday spirit. One of the best chocolates I’ve found for dipping truffles, cookies, and other delicious treats is GREEN & BLACK’S ORGANIC 85% Dark Chocolate. It melts incredibly smoothly and I have no need for adding additional butter or oil to thin it out, as I do with some other brands. Just set it in a heatproof bowl over a pan of water, and stir until melted and smooth. It’s also just the perfect bittersweet chocolate flavour that I love, and it complements sweet baked goods so well. GREEN & BLACK’S ORGANIC chocolate is, as the name suggests, certified organic and they take great pride in sourcing the best organic ingredients for their chocolate. It is also Fair Trade certified, so we consumers can rest easy knowing that they are supporting the farmers and workers from around the world who supply the ingredients. 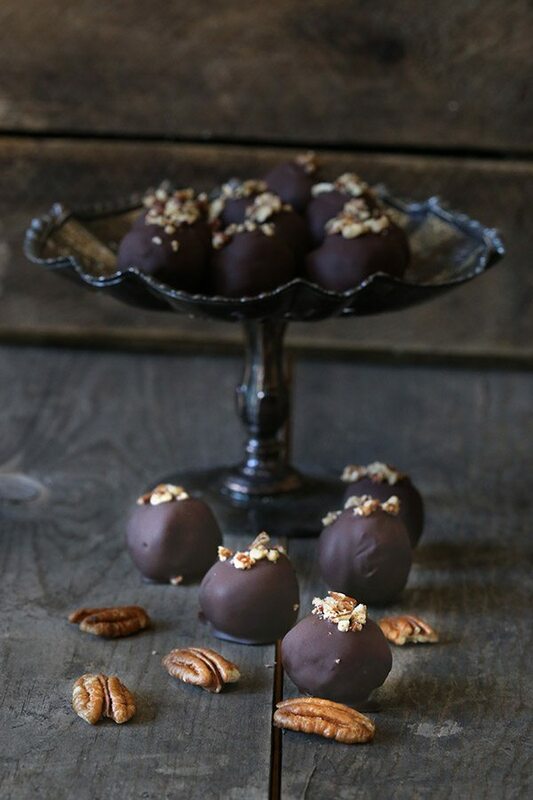 I’ve had my eye on creating some Pecan Pie Truffles for a while now. And they seemed like the perfect way to showcase GREEN & BLACK’S ORGANIC 85% Dark Chocolate for the holidays. These no-bake treats have a cookie dough consistency but all the great flavour of one of my favourite holiday desserts. And they look so pretty, all dipped in bittersweet chocolate with a sprinkle of chopped pecans. These are definitely a treat worth sharing with friends and family. Make a double batch because you are going to want some for yourself too! Disclaimer: This is a sponsored post written by me on behalf of GREEN & BLACK’S ORGANIC Chocolate. All opinions are 100% mine. Looking for a vegan treat? Try these No Bake Paleo Chocolate Pecan Bars from Beaming Baker. 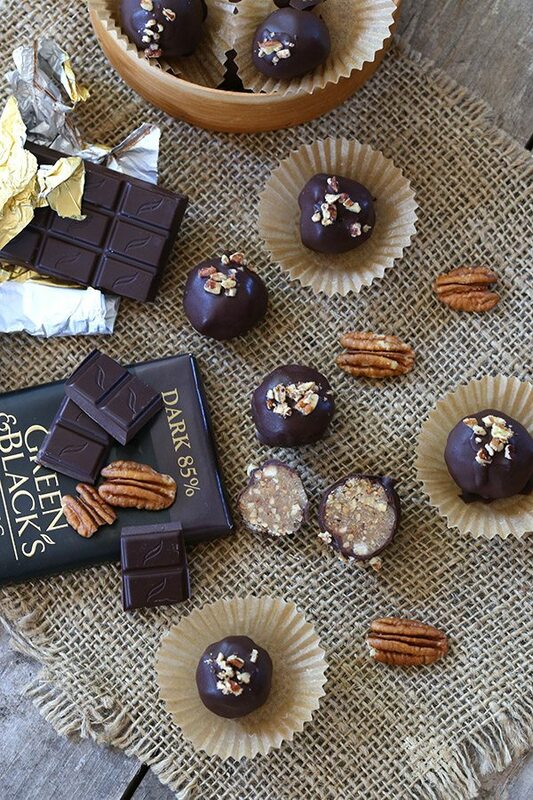 Little pecan pie bites dipped in delicious dark chocolate. 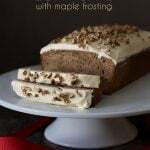 A wonderful low carb treat for any time of year! Prepare caramel sauce according to directions (you can make a full batch, just use 1/2 cup for this recipe and refrigerate the leftovers). Let cool about 10 minutes. In a food processor or chopper, finely chop pecans. They should be mostly ground with some slightly larger pieces. Reserve about 3 tbsp of chopped pecans for springing and transfer remaining to a large bowl. Add almond flour, powdered sweetener, and salt to bowl. Whisk to combine. Stir in caramel sauce until dough begins to clump together. Using about 1 tbsp of dough at a time, squeeze together with your hands and then roll into balls. Place balls on a waxed paper-lined cookie sheet. Freeze until firm, about 30 minutes. Set a heatproof bowl over a pan of barely simmering water, making sure the bottom of the bowl does not touch the water. Add chopped chocolate and stir until melted and smooth. Working with one ball at a time, dip into melted chocolate and toss to coat. Lift with a fork and gently tap against the side of the bowl to remove excess chocolate. Quickly sprinkle each ball with a little of the reserved chopped pecans before the chocolate sets. Refrigerate until set. Serve at room temperature for best taste and texture (can be stored in the fridge). Serves 12 (2 truffles each). Each serving has 8.61 g of carbs and 3.62 g of fiber. Total NET CARBS = 4.99 g.
I used to dip pretzels in chocolate and make potato candy (cooked potato, confectioners sugar, coconut, and bittersweet chocolate. But now I just love to eat my dark chocolate. It’s just my dad and me now and no point in making all the fancy candy when I can just enjoy my daily fix. I definitely can just eat chocolate on its own. 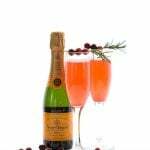 I love to mix it with anything salty, dipping gluten free pretzels, drizzling over popcorn or salted nuts. These look amazing! I like to dip chocolate squares in almond butter. Simple but delicious. “Straight”…if it’s not broken…don’t fix it…or just enjoy those broken pieces! chocolate is my go to sweet – love the contrast of chocolate with nuts, or something salty but I also love unadulterated chocolate on it’s own!! I’ve come to find that using chocolate bar to chop and use in recipes makes a much better product than using chips in my opinion. I love Green & Black’s organic chocolate. It’s definitely a staple in my house. I can’t wait to try this recipe as there are so few ingredients and the pictures look so delightful! Green and Blacks 85% Organics is my FAVORITE! I always keep a bar (or three) in my pantry! For my LCHF lifestyle I can have a bite or two and stay on plan. Will definitely be making these truffles and soon!!!! where can u buy that brand of chocolate? Well, lots of places! Amazon, of course, but I see it now in plenty of regular grocery stores. Vitacost is a great online store and usually have some of the best prices. They also provide free shipping if you spend $49 or more. I’ve used them for over 10 yrs now and they’re really great. I’m a drizzled kind of gal! I love to (heavily) drizzle chocolate on cookies, pies, ice cream, salty snacks, bacon…you name it! Every year I make some kind of chocolate candy treat for family and friends but since I’m on a low carb way of eating, I don’t know if I could trust myself around chocolate these days… But this chocolate seems to fit the bill, these look scrumptious! I love to have a piece of dark chocolate every night after dinner. Dark chocolate is great on its own as a special treat, or sometimes I did prunes in a little melted chocolate. I use that for a special treat when I’m exercising and my blood sugar is a little low. I incorporate chocolate every way I possibly can! I love rich homemade hot cocoa, cookies dipped in chocolate, luxury candies and of course straight chocolate. Chocolate is always on my mind and is a large part of my ingredient list for holiday baking! I have grown to love dark chocolate and prefer it over any other type of chocolate. 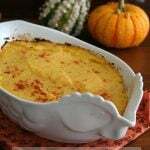 I use it in many of my recipes for the holidays and chop it, melt it, drizzle it, dip it, any way that I can think of to enjoy its flavor and goodness! As far as chocolate is concerned, I consider every day a holiday! I literally eat dark chocolate every day, usually as my dessert/treat at night (though often it’s beside my cup of coffee in the morning, too). At Thanksgiving and Christmas I’ll typically make some kind of decadent chocolate dessert to get us in the holiday spirit. For good dark chocolate like Green and Black, I like to let it slowly melt in my mouth as I savor every wonderful nuance of flavor! I had planned on making a chocolate pecan pie for Thanksgiving but your truffle recipe seems a better choice. I can make them ahead of time too–huge bonus for me. Every Christmas my kids and I make peppermint bark with both white and dark chocolate. We give some away as gifts and it’s our favorite holiday treat, next to real chocolate hot cocoa and homemade brownies. Dark chocolate rules! I love making cheesecakes with chocolate ganache. I’m going to try Green and Black’s chocolate now! Your description of it as well as imagining the bittersweet along with the sweet of the truffle was perfect. I love that it’s fair trade and appreciate the shout out on their behalf. I will make these…right after getting the chocolate! Thank you! I love to just eat the chocolate straight. I stock up on my chocolate bars when they go on sale and keep them in the refrigerator. I can’t wait to try this recipe. This sounds wonderful. I want to make a batch for my family too but my mom hates dark chocolate. Do you think making a batch with milk chocolate would taste good too? I clicked on the Official Rules link, and I got a 404 (think it was) error – access to page denied. These look & sound really good! I’d love to win some of their chocolate, not to mention the money (gift card). I don’t have twitter or a blog site. I don’t see my original post, which stated that I got an error message when I clicked on the rules link (404 I believe). Possibly because I used the wrong email address on it. Oops! If it repeats, I apologize! Oh and thank you for this chance to win! I Love chocolate, especially dark chocolate. (Even the amount of sugar that is in 82% scares me tho. I joined twitter just so I could post about your recipes & etc. Oh man I love chocolate. Dark chocolate! I usually incorporate it into my breakfast if possible and eat some everyday whether plain or with something! Chocolate any way, any time 🙂 I typically use it chopped and included in cookies,scones or other baked goods. I am a fan of Green & Black Organic chocolate – I buy it at my local health food store. “C”… all of the above! We still make candy and dip it, but I have also learned to eat unsweetened chocolate straight and I love it with hot coffee for a snack! (along with my unsweetened tea, coffee, etc. chocolate is just another taste I have grown to love straight and unsweetened)!! I am planning on making these for Thanksgiving this year! They look yummy.. grandkids will love them! Yum! Dark Chocolate Bark with dried cranberries, unsweetened coconut and raw almonds. 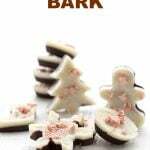 The perfect Holiday Bark! My absolute holiday favorite is actually the cookies with the Hershey’s kiss in the middle! I can’t recall for the life of me what they’re called, but to me they are a holiday tradition. I love grating a little chocolate into my coffee, adding some chips into my pumpkin pies, swirling some into my cheesecake…yup…just eating it, too! I love to chop up some nuts, add a bit of sea salt, and coat in dark chocolate. Then I drop by spoonfuls on to waxed paper to make nut clusters. So good! I make holiday gifts of chocolate dipped pretzels, truffels, chocolate covered oreos. I go through massive amounts lol! That is so lovely to hear, thanks for the compliment D’Ann. Both! Can’t go wrong with chocolate. I always have to make traditional fudge and then low carb treats for myself but have been converting everything over to low carb slowly so the family doesn’t revolt…lol. These truffles are absolutely on my to-make list. I usually have great intentions of making wonderful things with chocolate, but end up just eating it as is! Green & Black makes wonderful chocolate. Would this work well with Lindt 90% cocao? I have a stash of Lindt and prefer the 90%. Everything is better with chocolate and I do love this brand! Well, I have a daughter whose birthday is always right before, right after, or on Thanksgiving. She is asking for a double layer cheese cake and chocolate frosting. So, I’m using your chocolate ganache on top this year. She wanted the same thing last year so maybe it’s a new sorta-Thanksgiving tradition as she is my Thanksgiving baby. I do love Green and Black chocolate! Sometimes my husband will bring home a dark chocolate bar for me. 🙂 It’s the best. I prefer it over Lindt, for sure. Happy early birthday to your daughter! Thanks! She’ll be so excited you said that. They all know you. If I bake something I usually get asked, Is this Carolyn Ketchum or Maria Emmerich? Lol! Oh my. I told her. She said, “WHAT?! She is a famous person and she said ‘Happy Birthday’ to ME?” I think that made her day. Oh my heavens, I am not famous but that is seriously cute! I incorporate chocolate in to the holidays b melting it when I make fudge. During the Holidays, I melt the chocolate to make my Basic Homemade Fudge. Christmas would not be Christmas without fudge! I use chocolate to make dipped cookies or truffles, chopped into cookies or bars, melted into a decadent tart, used in the icing of a bundt cake, broken into small pieces and on a cheese/meats/nuts plate… All sorts of holiday goodies! I love dipping various things for the holidays–pretzels, dried fruit, nuts. Add some sprinkles and it’s very festive! I will eat my chocolate plain and in Carolyn’s Pecan Pie bars this holiday season! I love making Dark Chocolate turtles for Christmas! They are so good and so easy to make. I try to always make some sort of candy for our sweets table! I will let someone else go for the giveaway prize; I just wanted to chime in that these truffles are perfection. Great on a cold afternoon or for a simple dessert: a steaming cup of cinnamon or fruit tea along with a couple of squares of dark chocolate and a few pecan halves. Love that Green & Black’s is organic AND fair trade! Already love your caramel sauce… the truffles are a must!! I like melting dark chocolate to make almond bark or putting it into bite sized candy molds. I like to melt chocolate and spread it over the crust of a cream pie. I saw a recipe years ago in a cooking magazine where they did that, but on the crust of a pumpkin pie. I haven’t tried that, yet, but maybe this will be the year I finally do. First, I want to say how much I appreciate your blog. As a WLS patient, I need to limit my carbs for health and other reasons (like immediate side effects *ahem*), and so far everything I’ve made from your blog has turned out perfectly. Not one failure, so thank you!! As for chocolate? I would eat it even if I melted it on my shoes. So many options. I can’t pick just one. I am not sure what WLS is but I am glad to hear my recipes help! Chocolate ALWAYS has a place on the dessert table! I like to make pecan pie with a chocolate drizzle… yum! 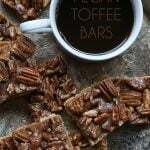 These sound so yummy and I love Pecan Pie so these will be a must try on the list! I’m an all the above kid of girl! I like chocolate any way I can get it! I would break it up and use it in my energy bites with dates figs and prunes as well as pepitas and pistachios. I eat it straight up (in secret, I don’t like to share my stash with unappreciative kiddos 😉 ) or I bake with it: chocolate chip cookies, seven layer bars with an extra thick layer of chocolate, cake, mmmmm. That’s an easy question! I use chocolate in every way imaginable during the holidays. I melt it to make bark, I chop it to add to the top of cakes/cupcakes, I chop it to use in cookies/bars AND I melt it into my homemade pudding. I am the original chocoholic! This is an easy one – I love hot cocoa! I especially love a mug of good rich hot cocoa. It reminds me of when I was young and my mother used to drive us around town to look at Christmas lights. We’d always stop somewhere for a hot beverage to keep us warm. Nothing makes me feel the holiday spirit more than holding a hot mug full of chocolaty goodness! I incorporate chocolate into my baking…holiday and otherwise…any way I can! I’m drawn first to any and every baking recipe that contains chocolate, then i MIGHT pay attention to other! These truffles look heavenly. I like that they are bite sized so i can have my pecan pie without all the calories!! I’ll take chocolate however I can get it! 🙂 However, my favorite way is over toffee – those two flavors just do it for me. I love making low carb rocky road. I start with homemade low carb marshmallows, coat in chocolate and sprinkle on walnuts. The best! I’m a dipping kind of gal, but I always keep some chocolate in the freezer and have a square or two in the evening! My husband makes the most delicious fudge, and chocolate covered pretzels, neither of which are remotely low carb, sadly. We usually buy one box of Belgian truffles to share with the family, but this year I read the ingredient list, and I think I can make them better and heathier fairly easily. sugar free marshmallows dipped in 85% dark chocolate makes my Christmas complete! I love to make chocolate gifts for the holidays! My favorite is chocolate covered carmel pretzel sticks. (So bad, but so good) I also make chocolate spoons I gift with a cofee mug at Christmas. Since having a stroke, I find that making treats (much as I love them) is just too difficult one-handed, but I can still manage to eat them if someone else makes them. If not, I can still eat the bar. I eat it straight up plain! Yum! Oh Carolyn, words cannot describe how awesome these are! I am a huge chocolate pecan pie fan and now that my husband and I are sugar and grain- free, I thought I would never again enjoy the flavor of the dessert I so dearly loved, but you have duplicated it in this amazing recipe! I am making my second batch in as many days. This will be go-to recipe for candy this Christmas season and beyond! Thank you, thank you! I like to incorporate chocolate in every way I can. Dip candy in it, mix it into cookies, melt it into brownies, and eat it straight. I like to melt, dip, drizzle and grate chocolate on to just about everything, especially during the holidays to share with friends and family! Mmmm chocolate….I love it in low carb recipes, or with just a tiny bit of peanut butter, or by itself. I love to make gifts by dipping pretzels, etc and give them to friend and family. I like to melt and pour my chocolate into some of my favorite recipes. Oooo, Toffee Crack! Toffee poured over saltines, covered in dark chocolate, so good! We love to bake chocolate pecan pies for holidays. I definitely melt chocolate for the holidays as I usually make several things of fudge to share with friends and family this time of year. I either eat it straight or use it to pour/dip on cheesecake or turffles. It’s my favorite chocolate brand ever! If this was the only dessert at Thanksgiving dinner, I’d be a very happy girl. DELICIOUS!! Dark chocolate in shakes, dipped in PB, eaten any way is delicious! We make peppermint bark every year, with white chocolate and also chocolate ganache. So yum. Right now, there are two favorite ways that I eat chocolate. I like to put them with low carb waffles and I also like to put it in whipped heavy cream. Straight up as an afternoon treat; but to share I’m planning on making a dark chocolate bark with dried cherries and chopped pistachios. I am very thankful for all of your recipes! I am making my grocery list today and these ingredients are now on my list. Blessings! Snapping off a small piece of a milk or a dark chocolate bar and popping that into my mouth is my favorite way to devour good chocolate. It melts slowly, and I am very happy. Green & Black’s chocolate is my favorite. I eat it straight. I also coat truffles with it. I love coconut truffles coated with 85% Green & Black chocolate. They’re like mini-Mounds bars, but less sweet. I do them low carb with Swerve and stevia. I need about 10 of these right now! So delicious! I eat a small piece of Dark Chocolate after dinner everyday of the year but during the holidays I like to bake with it. Chocolate chip cookies with chunks of dark chocolate and candied pecans are my favorite. I definitely love my green and black’s chocolate! I’ve been eating more and more dark and found an awesome chocolate mousse to make with it! 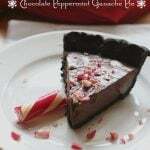 I like to incorporate chocolate into my holiday with chocolate filling for pies, chocolate candy, try to have as much chocolate as I can eat, and I do love dark chocolate. I mostly just eat chocolate straight, any time of the year! And I love to make chocolate sauce to top my ice cream and cakes. 🙂 Can’t wait to try your recipe. I don’t bake for the hoidays I melt. I melt chocolate for fudge. I melt chocolate for what I call Chinese Chocolates. When surveyed after the kids were grown those two holiday treats were their favorites. I simplified by forgetting about cookies and focusing on melting. Besides the holiday pies, quick breads and cookies/cookie bars that I’ve made for decades, I’ve been expanding into candy for the past several years. Truffles and chocolate-dipped candies in particular. I look forward to trying your truffle recipe! 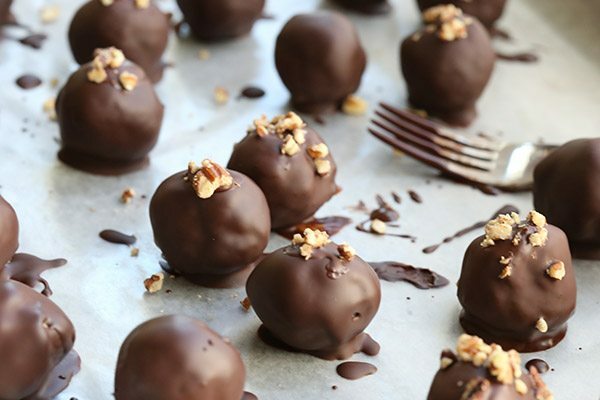 Peanut butter balls dipped in semi-sweet chocolate have been a holiday staple for generations! And there’s always chocolate around for hot cocoa and cookies! I am a “choco-holic” ! I pretty much must have at least a piece of chocolate every day! When our kids where at home, every Christmas we would dip “Ritz Bitz” peanut butter filled crackers in chocolate. Apparently it is still a family favorite as my kids are now doing that with their children. I also love pecan pie so I am very much looking forward to trying these! I love chocolate just on its own and Green & Black’s is one of my favorites! I was always a milk chocolate gal until I started LCHF now I am warming up to Dark Chocolate. I ‘ve read good things about Green and Black’s and look forward to trying it especially with this truffle recipe. I think sounds delicious. Hello, Carolyn. I really look forward to your e-mails. Love your recipes and your outlook on life. My chocolate never seems to make it into many recipes because I love to eat it square by square with a nice cup of tea or coffee. It makes a totally satisfying dessert in the evening. I have not had Black and White but I’d love to try it. These candies look pretty delicious, but chocolate plain, pretty much anyway it can be used is good. I combine it with nuts and dried fruit. I like to add chopped macadamia nuts to melted chocolate and then sprinkle it with kosher sea salt. I like to incorporate chocolate into my holidays by both eating it straight and by baking with it. I tend to eat a lot of chocolate candy during the holidays and I also like to make cookies that have chocolate in them. You know, a little square of chocolate and a good red wine are so satisfying after a good dinner! We are all chocoholics in my household so we tend to eat chocolate in all shapes + forms. I personally buy dark chocolate bars to divide it into small portions which I slip into snack baggies. I can get my chocolate fix yet feel that I’m practicing portion control. I love gifting chocolate. I either give it as full bars or with the bake goods I make. These look fabulous. When I eat sweets, it usually involves something caramel in flavor. As for chocolate, if it’s not surrounding something caramelish, I am enjoying it more and more just straight up – sans sweetener. Amazing from someone who in my previous sugar-filled life used to crave Cosmic Brownies. Is there a wrong way to eat chocolate? Eating it straight – break off a piece, and let it melt in the mouth — ahh… heaven! YUM! Oh yeah! With toasted nuts and coconut! Yum! We love hot chocolate and chocolate muffins and at special occasions we set up the chocolate fountain. I eat it straight! My mom makes peanut butter balls and I eat them! I have found that over the holidays eating a small amount of plain chocolate is enough to help me feel like i’ve indulged and helps me avoid the higher carb choices that surround me when out and about. I like to chop it into something i bake! Yum, or drizzle chocolate over the top. I like to melt in my chocolate pumpkin chiffon pudding that I came across Elana’s Pantry. We drop the pudding into mini pie tarts as the perfect bite size dessert. I find chopping chocolate to be therapeutic, for some reason. I would at the chopped chocolate to your delicious pecan pie muffins. Love to dip a little dark chocolate in peanut butter. Always a good combo & instant treat. It is always a Holiday tradition to have Mexican Hot Chocolate or Champurrado. I can’t wait to try the 85% Green and Blacks Dark chocolate in the recipe. I have been looking for a dark chocolate that I don’t have to add oils for it to melt smoothly. Happy Holidays! Oh my, yes! Dark chocolate. I can eat milk chocolate to be polite but one of the pleasures of dark is that edge of bitterness. It never palls! Bliss when one discovers a dark chocolate with velvety meltability. Ecstasy in the mouth! If you don’t like dark chocolate, that’s okay. More for me! I love Green & Black dark chocolate as my go to treat after meals. It’s so creamy and I love that it is fair trade. It is also a treat that I don’t have to share because my kids don’t care for dark chocolate! 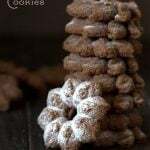 Very nice website and delicious recipes. These truffles are da bomb!!! So awesome! Made them for a holiday dinner with friends who are now asking for the recipe link. 🙂 And I need to go hide the last few from the hubby so I have some left! Thanks for the amazing recipes. Especially the ones with chocolate! I really want to try this chocolate and this recipe. My great grandmother use to make chocolate gravy she use to put it on ham and biscuits. But these days I mainly put it on biscuits with a tad bit of coconut oil or a lil slice of butter. So glad to keep chocolate recipes in the family! I use chocolate to make home made fudge for the holidays. 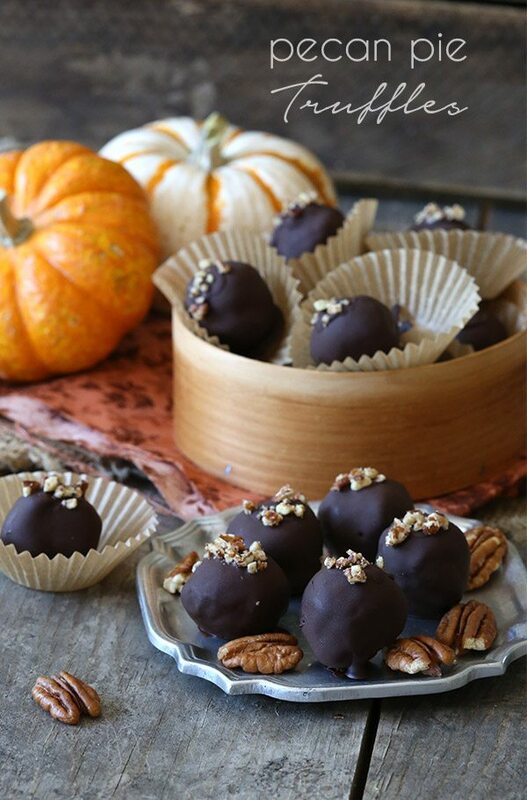 I like to drizzle melted chocolate over a little pile of pecans – and now that I know about your caramel sauce, I’ll experiment with making turtles! My fave way is to eat it straight. I enjoy dark chocolate straight from the wrapper or melted as a dip for fruit. I absolutely love dark chocolate! It has a soothing, calming affect. It is my mood stabilizer! I have two favorites. I make very simple buckwheat muffins that I keep on hand for an easy ready to eat item. To make dessert like I like to make a sort of dark chocolate thin ganache. I dip the top of my muffin in and my muffin turns (almost) cupcake like. Next up is, of course, a dark chocolate hot chocolate! I use it to make brownies, fudge, cookies, etc. Just about anything that I can think of with chocolate gets made! I prefer chocolate dark, spicy and soft (melted in the wrapper on the dashboard so I have to lick it off makes me happy). My favorite desserts are truffles, fudge & brownies (always spicy if I’m making it just for me!). A favorite candy bar I make has nuts, sea salt, cayenne, curry, & cinnamon. Once in a while, to switch things up, I add toasted coconut, ginger chunks, orange peel or coffee. I love to add it into cookies however I can! I like to use chocolate to bake with. I always make fudge for Christmas. we make lots of hot chocolate during the winter months. I love to melt and dip it but I also love to eat it straight. I love chocolate every way imaginable. From cookies and fudge to straight chunks, I love it all. I like to make cookies and cheesecake with chocolate. This will be awesome in my low carb lava cake recipe! I like to use chocolate in many different ways – there isn’t a bad way, is there? Straight up, or in one of your many amazing recipes!! My kids love chocolate chunk cookies, and chocolate-dipped truffles and shortbread. Low carb, gluten-free, of course! Thanks for all your great ideas! I usually eat 85% chocolate all by itself but every now and then, I like it drizzled over popcorn. Love that salty sweet combination. Dip a peanut butter cookie in chocolate! I also just like to put a piece of chocolate in my mouth and just let it melt. (Ok, my mouth is watering now, have to find a piece of chocolate). I love to melt in down & pour over walnuts or pecans. Sometimes I add peppermint extract & macadamias. Love eating it and have been craving truffles. Thanks for your wonderful culinary skills. I love using this dark chocolate for drizzling and melting to cover these scrumptious morsels from your great low carb recipes. Yum! I love it straight! With peanuts! A little bit in the evening takes away the cravings, but it is also great coating other delicious treats. Chocolate goes with cookies, cheesecakbe, berries, & of course by itself! I would definitely make these candies with the chocolate. I also like to make fat bombs with chocolate. I like to dip pretzels in chocolate, then eat the bits and pieces that survive melting. My absolute FAV way to incorporate chocolate into my holidays is by way of my mom’s homemade chocolate walnut fudge. MMMMM! I hope I get some this year! I love dark chocolate just like it is with a nice hot cup of Bustelo with heavy cream. Puts a smile on my face. I make a lot of brownies and fudge for Christmas.But I love chocolate in any form. I love dark chocolate and Green & Black’s is my favorite brand! I usually eat it straight, but this recipe looks amazing. I like to incorporate chocolate into your holidays by having it dipped over vanilla ice cream. 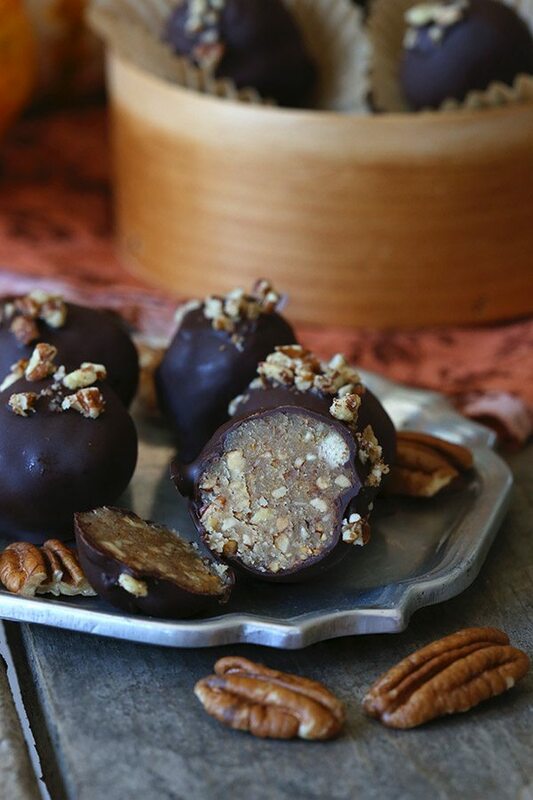 I love incorporating chocolate all kinds of ways during the holiday- by cooking with it (melted or in cake or cookie mixes), by buying it to eat just by itself or buying it to give as gifts- chocolate covered nuts or regular boxed chocolate! I can’t imagine life without chocolate ! I melt it and drizzle it over fruit! My husband and I like to eat a square of Green and Black chocolate with coconut oil spread on top after dinner. I like a sprinkle of Himalayan salt on top of mine. I don’t have a lot of time to make things and this is a wonderful quick dessert that hits the spot! My favorite thing to make is chocolate covered dog bones. The white chocolate dogs can have and they LOVE it!! I dip salted caramel rice cereal treats in dark chocolate and sprinkle with sea salt. I also make a chocolate chip cookie with grated dark chocolate instead of chips and sprinkle with sea salt. I love to “eat” my chocolate by stirring in my cup of hot coffee, with half & half and some stevia. So delicious. Love! I love me some chocolate. Not much I would not be willing to try it it had chocolate attached to it. You can freeze them before they are dipped in chocolate.